Mike Butcher of the Telegraph in the UK has written an interesting article about having to replace his dead notebook and making a conscious decision to use only open source software and free web based services. There are plenty of great applications listed here and, if you are like Mike and in need of upgrading / replacing or you are just cost conscious you should seriously consider the options here. For years analysts have said this day was coming, I think we are finally getting there with these web 2.0 apps. Only a week out of the box and developers and hackers alike are having a meetup in San Francisco for the first ever iPhone Dev Camp. Wired says that "IPhone Dev Camp is an open forum for developers to build, test and optimize web applications for Apple's handheld device." The idea is to dive into the device, share undocumented features, and come up with new hacks. It will be interesting to see what comes out the other end on Monday! I'm not sure what is more impressive, the fact that these two young men took the time to build a Millenium Falcon out of lego, or the fact that they also took the time to make a time lapse movie out of the event. Bravo Paul and Greg! It seems as though many government agencies and businesses are turning a cold shoulder to Facebook, the social networking site that was originally open only to students but has recently opened up for all to use. The CBC has the scoop on blocked access in Manitoba. Here is a very interesting story that the Globe and Mail is running regarding the affect that the Internet and YouTube in particular is having on the upcoming American Presidential election. Millions of viewers are tuning in to YouTube to view election related video, some authorized by the candidates and some not. The campaigners are definitely taking notice and trying to work the medium to their advantage. The last election showed the power of the Internet but bandwidth and social networking sites have come along way since then, it will be interesting to see how much impact technology will have. You as a Simpson's character! If you are a geek, and I assume you are if you are reading this, you probably are a Simpsons fan. This summer Homer and the rest of the Springfield inhabitants take their show to the big screen. 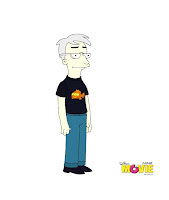 In support of the movie Matt Groening and company have developed an interactive web site that, among other things, allows you to create your own Simpson's avatar. Many famous geeks and celebrities alike have been immortalized as Simpsons characters; Tony Blair, Sting, U2, Stephen Hawking, to mention a few. Know you too can create your own likeness... this is what the Great Big Geek would look like, or something similar. Microsoft was busy on the announcement front yesterday. Firstly, the have admitted that the so called ring of fire problem with the Xbox 360 will cost them $1 billion to cover the cost of extended warranties that it is offering system owners who have experienced the problem, which is indicated by three red flashing lights on the console. Despite the problem Microsoft says the Xbox division will still make a profit for the fiscal year beginning July 1, 2007. In other 360 news, Microsoft has announced an October launch date for the new Xbox 360 Elite. The console will go on sale first in Japan where it's predecessor's sales lag behind Sony and Nintendo. Finally, Microsoft is planning to open a software development center, likely in Vancouver, the move is to allow the company to hire talent from abroad who are having difficulties obtaining work visas to enter the US. BBC News story here. Your weather update from Honda! Honda Motor Co. has demonstrated an upgrade to it's on board navigation system that will be available later this year on Honda Fit models in Japan. The service will alert drivers of hazardous weather such as heavy rainfall and seismic events. The system is, at least partially, two-way in that it collects information from cars that are fitted with the device and is able to relate the data collected to road conditions. Honda says they will be able to alert cars, in the future, to road congestion and detours. There are no plans yet to deploy the technology outside of Japan. The CBC's website has the full story here. For some, blogging is a chore. A lot of people try it and quickly tire of it, or they want to try it but can't find the time in their busy schedule. There are however a number of new services such as Twitter or Jaiku that offer a quick solution to those wanting to keep their friends and followers informed but don't want to invest the time in blogging. Twitter for instance simply asks "What are you doing?" and provides 140 characters in which to respond. The site can be updated through a traditional web interface, via Instant Messenger (IM), or by texting a message on your cell phone (sms). I've had a Twitter account since March of this year, but have not been very good at keeping it up to date. Thankfully there are a number of Twitter applications that enhance the Twitter experience. As of today, thanks to Twitterfeed, my Twitter account will be updated daily with posts to this blog. Even if I don't tweet regularly, my Twitter followers will be able to see my recent blog posts, and to complete the circle if I tweet you'll be able to see it on this blog... scroll down the page, just above my links. I've found blogging a little easier to get into, but I also know of many people who have abandoned their blogs in favor of tweeting. Big media and celebrities alike are utilizing both, so if you've been debating the merits of blogging why not give tweeting a try? Researchers have in the past suggested that moderate consumption of beer and wine have a variety of health benefits ranging from lower risk of heart disease and certain cancers. The U.K.'s Telegraph reports here that Italian researches are finding that wine, red or white, "could make a good antibacterial mouth wash to fight tooth decay and a sore throat". The study published in the Journal of Agricultural and Food Chemistry showed that wine was effective in inhibiting the growth of several strains of streptococci bacteria that are involved in tooth decay, and some cases of sore throat. Red wine was more active than white but both had positive affect. Sounds good to me, but is it a coincidence that the researchers were from Italy? Armed robbers in Orange County Florida ordered the manager of a GameStop store to empty the safe, and then asked him to pack up several game systems before taking the surveillance tape and fleeing the scene. Police investigators believe the games systems were the real target of the theft, I think they were after the money but wanted something to do to pass the time while they lay low. Florida's WFTV.com has the story. Last week I blogged about the CBC and Facebook teaming up to ask Canadians about their pressing concerns for the future, now comes the story of CNN and YouTube banding together to solicit the voters questions for the presidential hopefuls. YouTube is providing the platform for everyday Americans to record and post their questions to the candidates, CNN will screen the submissions and pose the best ones. The first of several live debate occurs in Charleston, on July 23rd, and if your question is chosen, you may get the opportunity to watch it live and provide commentary for CNN. Another example of big media jumping on the social networking bandwagon. A study conducted in the U.K. by the Energy Saving Trust has found that while our household appliances are getting increasingly more energy efficient, our entertainment devices are energy hungry. In fact the new digital technology is sucking up as much as 4 times the old analogue devices. The Energy Saving Trust is a group established by the U.K. Government after the 1992 Earth Summit in Rio de Janeiro, and is a great resource if you are interested in doing your part to save the planet from global warming. Regardless of whether or not you buy into Al Gore's theories, there is no need to waste! BBC has the story complete with comparison graph. Thanks to engadget for this story. The Register is reporting that "Famed reverse engineer Jon Lech Johansen claims to have discovered a way to "activate" an iPhone without signing up for a contract with AT&T." Johansen is somewhat famous for having hacked the iTunes encryption and has been a thorn in Apple's side for some time. The current hack apparently allows users to use the iPod and Wi-Fi capabilities of the device, but doesn't allow the use of the phone features. iPhone is currently only available in the U.S. and only on the AT&T network, a non-activated iPhone will not function except to call 911, if Johansen's claim is true the iPhone could be used as a cool but expensive iPod. It's only been a few days since the release and many sites have popped up claiming to be able to hack the iPhone to allow its use on other networks and in other countries, these for fee services should be avoided in my humble opinion. As always , consumer beware! It's highly unlikely that anyone has totally cracked the device this quickly. The "God Phone" as it has been dubbed is such a hot commodity that some may be willing to take the chance, but from what I've heard and read I think I'd rather wait for the next version anyway, there still may be a few things for Apple to work out before it reaches deity status in my books. Microsoft, Humber College, YMCA, The City of Toronto, and the Humber Students' FederationGlobe and Mail story here. have all pledged funding and in kind contributions to offer a new media centre for inner city youth. The program is aimed at young people aged 9 to 25 and hopes to provide a free outlet to foster creativity by providing equipment, software, curriculum, and mentoring. Concentrating on two of the City's priority areas, Rexdale and Jamestown, the City hopes to take the program to 13 other neighbourhoods plagued by guns, gangs and violence. Truly and community effort here, hopefully support will continue and the program will flourish. Mexican telecom tycoon Carlos Slim has overtaken Bill Gates as the worlds wealthiest person according to the Forbes annual rich list. Slim more than doubled his personal net worth to an estimated $67.8 billion dollars, up from $30 billion last year, dethroning Gates who held top spot for 13 consecutive years. Looks like IT is still a profitable venture. Free music downloads... if you are fast! TechCrunch has reported that Amie Street turns one year old today. Amie Street is a music download service similar to iTunes but with a distinct difference. Artists (including Bare Naked Ladies) upload their tracks for users to download, the songs are initially free and increase in price from $.01 to $.99 as they get more popular. The artists in this case actually get 70% of the income which is a huge difference from what they get when signed to the major labels. Not only can you help the artists by purchasing through Amie Street, but the first 5000 (make that 4999 ;-) TechCrunch readers who enter the promo code "TechCrunch" will receive a $2.50 credit. Act fast, they are going quick. Is the Kremlin waging information war against opposition and media? Opposition parties and media outlets that are critical of the current Russian government say the Kremlin has employed its vast resources to hack and cripple their Web sites in an attempt to "stifle Russia's last source of free, unfiltered information". With parliamentary elections in December and presidential elections in March '08, the victims allege they are being harassed electronically by vast zombie networks. The Russian government denies any wrong doing, saying "hackers could easily forge Internet Protocol addresses registered to government offices." You believe that don't you comrade? Since you are reading this blog you probably fit into the category of folk who might find at least one of these vacation destinations interesting, I do! Check out Wired Magazine's "The Best Geek Vacations: The South Pole, Chernobyl, Tatooine" Not too sure about Chernobyl, but Tokyo sounds fun! Controversial Russian music downloading site allofmp3.com (404 error) has closed it's doors only to reappear as mp3Sparks.com. allofmp3 was subject of much debate especially during the World Trade Organizations talks regarding Russia's potential membership into the organization. The parent company of allofmp3, MediaServices, was subject of a number of lawsuits brought on by recording companies and their associations while the Russian government was being attacked for allowing it to operate. MediaServices has maintained that it pays royalties to a Russian licensing body and that it warns users from other countries to heed their local laws. The move to close down allofmp3 is being considered as a minor victory but one that holds little meaning if the service is able to resurface under a new name. BBC News story here. Housed in Vancouver and jointly accredited by the University of British Columbia, Simon Fraser University, Emily Carr Institute of Art and Design and British Columbia Institute of Technology, a new Masters Degree in Digital Media will begin with 35 students this fall. British Columbia, home to 1,100 digital media companies, most notably Electronic Arts Inc., sees the move as an attempt to maintain it's position in a global market that is heating up. The provincial government has contributed $40.5 million dollars to the program with support also coming from the private sector. The Globe and Mail has more here. In this release last week, Google has upped the ante on gadget development by offering developers an opportunity to tap into some cash for their efforts. Google Gadget Ventures is a program offering $5000 grants to developers who already receive at least 250,000 page views from the gadget and seed investment of $100,000 dollars to previous grant winners. To apply for a grant developers are asked to submit 1 page proposals while those interested in the seed money must submit business plans. Google says "Our hope for Google Gadget Ventures is to enable developers to grow and diversify the universe of gadgets in a profitable and sustainable way." Nothing motivates a developer more than cash... except maybe food and/or caffeine! Here is an interesting clip on the Globe and Mail's site regarding the power of social networking in a philanthropic way. Sites are emerging to allow everyday folk to band together for larger causes, nothing terribly new here but interesting none the less. This weeks TWIT podcast debates "The Good, The Bad, the iPhone". If you are considering purchasing the new must-have device, you might want to listen. Leo Laporte and guests, Veronica Belmont (Buzz Out Load), Cali Lewis (geekbrief), Ryan Block (engadget), and Richard Baguley (wirelessinfo) all discuss their experiences in line waiting to purchase and then give their reviews the device. It's over an hour long... and the experiences were mixed. G4TV is reporting that the new Forza 2 game for XBox 360 could be trashing the game consoles! Apparently many users are experiencing multiple crashes when playing the game and some have claimed it has "bricked" their machines, causing the dreaded ring of death (referring to the red led ring that appears when the system goes down) G4TV is suggesting that you shelve the game until there is a statement from either Microsoft of the developer Turn 10. Minority report type ads coming to the web? Yahoo! has announced a new service called SmartAds which promises a more targeted approach to serving up advertisements on the web. As this news.com article explains, rather than offering up a generic advertisement the service will be able to provide ads that are relevant to the surfers gender, location and online activities. Ads for your local Toyota dealer would appear rather than the more generic manufactures ad, for instance. Up to the minute pricing can appear in the ad, combining Yahoo's demographic, geographic and behavioral targeting capabilities the advertising will be customized to each individual surfer. I'll reserve comment until I see how well it works but I like the localization aspect of the approach, living in a small town I'm not so sure they'll find advertisers who are really relevant to my location but we'll see. NASA has green lighted the decent of the Martian Rover 'Opportunity' into a large crater dubbed Victoria. The go ahead was given when it was determined that the scientific returns out weighed the risk to the rover. Opportunity and it's sister, 'Spirit', have been roving the Martian landscape since January of 2004, in what was to be a 90 day mission. Victoria is said to have been formed as the result of a collision with a meteor and is some 200 to 230 feet deep. Opportunity will first edge its way up to the rim of the crater and then back away to see how it performs, if it is determined to go forward the first target will be a ring about 10 feet down which represents the pre-impact surface of the planet, perhaps billions of years ago. Good luck little rover! CNN story here. We all own things, and if you are like me you probably don't have an updated inventory of your stuff. Ever wonder what your stuff is worth? Wish you could sell your stuff or donate it to a good cause? MyThings is a web site that allows you, for free, to safely store information about your belongings, all in one place and accessible from anywhere you have Internet connectivity. Make your things visible for others to see or keep them private. Keep information about your stuff, such as when was it purchased, how much you paid, when the warranty runs out. Let MyThings know that your vintage baseball card collection has been stolen and they'll scan new items being added by others to see if it shows up in someone else's inventory. Looking for some idea of what your grandmother's doll collection is worth, ask for a valuation and other MyThing users will offer their opinions. It's a neat service and worth checking out if you have stuff!